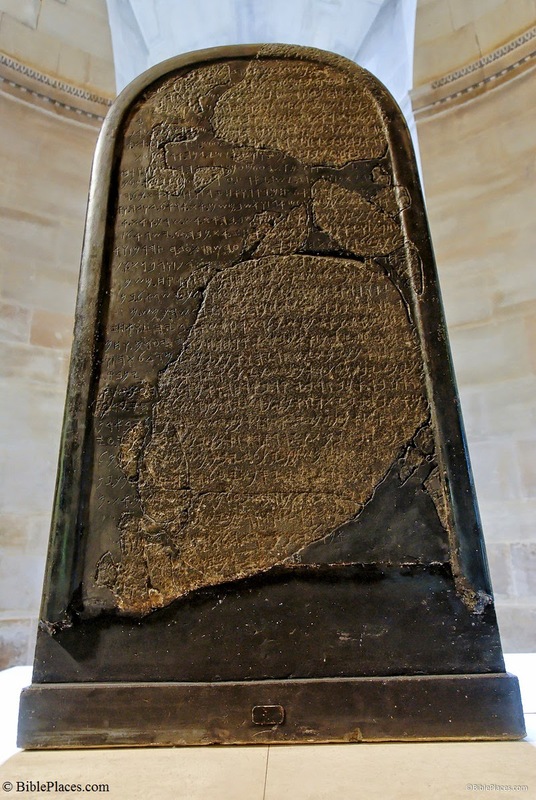 The Moabite Stone, also called the Mesha Stela, is an inscribed black basalt monument written in the Moabite language in c. 835 BC. It stands nearly four feet tall and was found in 1868 in the land of ancient Moab, now modern Jordan. It contains references to biblical figures such as Israelite King Omri and Moabite King Mesha (cf. 1 and 2 Kings), as well as the covenant name of God, YHWH (cf. Exodus 3). It is now located in the Louvre. The story of the discovery and eventual movement of the stone to the Louvre is quite interesting in itself. Originally discovered by a missionary, it was subsequently broken apart by the local population who heated it with fire and then poured cold water on it. Following this, they used the various pieces as amulets in their granaries. Eventually, after much wrangling among European powers and local tribes, 57 pieces (representing about 2/3 of the original) coupled with replacement parts were used to reconstruct the original. The reassembly was undertaken with the help of a paper squeeze of the surface that was made before it was broken apart. Future post(s) will comment on some controversial aspects of this important artifact.